With the launch of the iPhone 5, many are turning their attention once again to how mobile visitors are discovering the content they create. They’re looking at how they will effectively engage those visitors through the right content and advertising and how the right branded content can be appropriately optimized and targeted to the ever-so-engaged mobile consumer. On that note, our data, based on 200,000 publishers who reach 300 million people each month shows that mobile traffic has increased 27% this year so far. 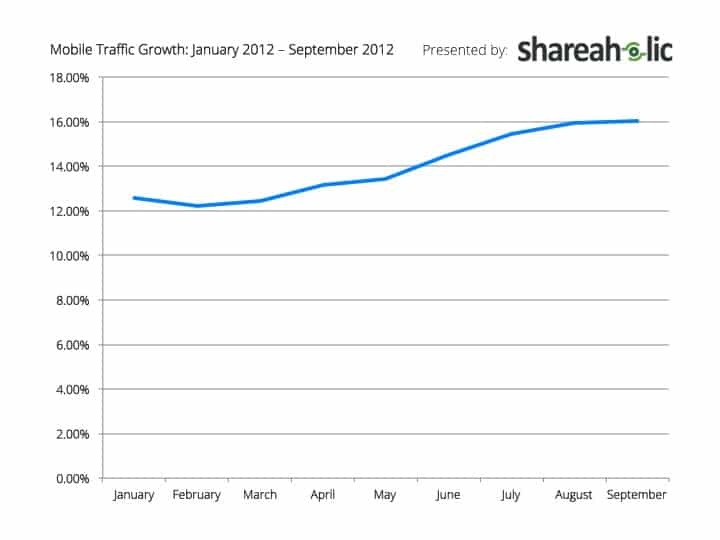 It continues to climb, now owning 16.02% of traffic in September, up .07% from owning 15.95% of traffic in August. 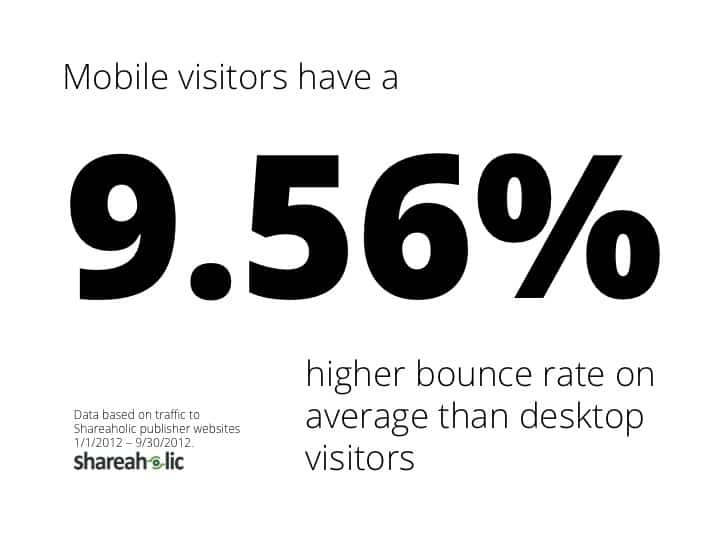 Mobile visitors have a 9.56% higher bounce rate than desktop visitors, and desktop visitors average 2.358 pages per visit, whereas mobile visitors average 1.979 pages per visit. With more smartphones and tablets, more mobile traffic is a given. Keeping that traffic on site long enough to take a meaningful action (share content, subscribe to content, or make a purchase from a product page) is the real key. This mobile traffic shift matters for both news sites and for brands. 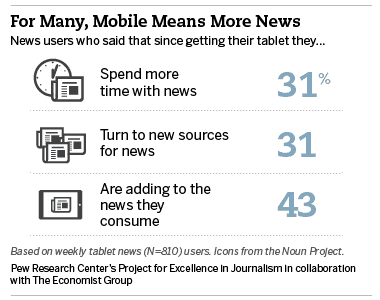 On the more journalism-focused side of content, new research from the Pew Research Center shows that news consumption is the #2 activity on smartphones and tablets, and that mobile users report consuming more news than they did before purchasing the device. If you have the technology to do something easier (consume news) you’re presumably going to do more of it. But more interestingly, nearly 1/3 of people who acquire tablets find themselves reading more news from more sources than before, according to Pew’s research. That’s right in line with our data, which shows that the bulk of mobile visitors are new visitors for our publishers. Brands have to care how their content appears to mobile visitors too. According to new research from Say Media, six out of ten people who own a mobile device use it to research products. What would a mobile visitor think of your product page? Something I wonder about: Is it nature or nurture – are we just not optimizing our sites for mobile consumers (both of products and news)? Is that why they leave so soon? Or are mobile visitors simply in a different mindset, arriving at your site for something specific and then leaving? As a consumer, I personally don’t browse on mobile. If I do pull up the browser on my iPhone, I’m there for something specific. That said, we just optimized the Shareaholic blog for mobile with a responsive design (thank you Chad!) and in just two weeks mobile the redesign decreased our bounce rate 4.63%. So I’m perhaps an outlier – mobile optimization does matter. 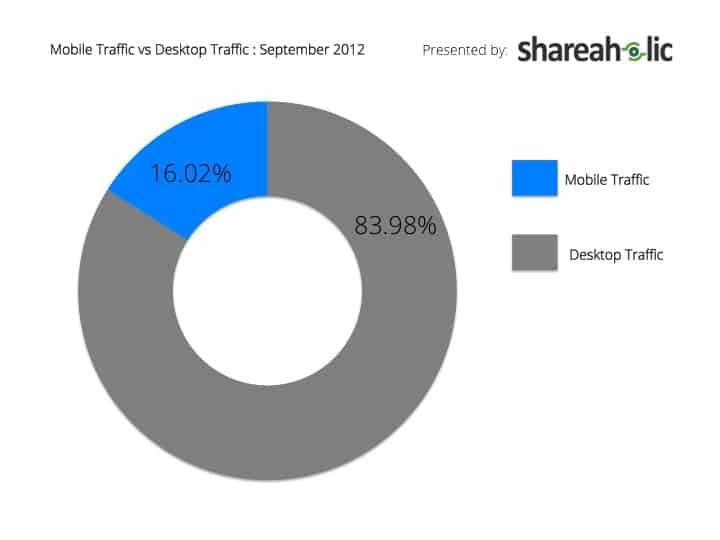 What’s on your mind when it comes to mobile traffic trends? Let us know in the comments. Use Shareaholic’s social sharing tools to increase engagement with your mobile visitors.